SL NEO servers allow generation of DTMF tones in the output program audio-signals, and, in such a way, mark the beginning and the end of regional blocks in signals of the central station. The cue-tones may be formed in any types of output signals: SDI+AE, AES, Analog Audio, DVB ASI/IP TS. When executing the playlist on the center side, certain playlist events (lines) may contain markers that set the mask - a sequence of any number of acceptable symbols for DTMF (0123456789ABCD*#). The rule for generation of tones will read off the mask from a certain column of the playlist line and form a command for generating the audio-sequence according to the mask, for a few milliseconds before the end of a marked clip: for example, the headline before the regional block (see the picture). The rule allows you to set the duration of tone bursts and the duration of pauses between them, to define the audio-level according to the dBFS scale and to choose audio-channels for inserting tones. The procedure of adjusting a new rule for generation of cue-tones is implemented from the control web-console of the server, menu section Manage, item Program Outputs. You should choose the item Actions in the appropriate window of the service Program Output, then find the tab Playlist Events and choose Add Action. In the field Name of the window Action Configuration specify the random name for a new rule, in the field Layer choose "1" (the main fullscreen layer of the playlist, controlling generation of tones). In the field Delay enter the value of delay from the start of the on-air event till the generation of the tone, in milliseconds. We will use this value for generating the tone before the event end and setting the time interval from the beginning of the cue-tone to the event end. In the field Address set the IP address of the server, or leave the field empty, if the value is localhost. Choose the service name by the button ... in the field Service. In our example, it is the playout channel #1 (ProgramChannel_1 on the list). In the field Action condition, find the field Variable and specify the playlist column that will be responsible for generation of the tone. For an example, let's choose GPI1 Value - enter the DTMF mask into the column of a playlist line that refers to the headline before the advertising block. Set the trigger as NOT EQUAL, leave the field Value empty: the rule will trigger, if the field GPI1 Value in the playlist line won't be empty. If you want a tone to appear certain time before the end of the on-air event, choose the item Trigger at end when primary matches. This item is available in SL NEO software versions 1.6.50 and higher. In the field Action Parameters find the field Param1, click the button ... and specify the playlist column that will be responsible for generating the cue-tone: in our example it's GPI1 Value. In the field Param2 you should choose the audio channel, where the tones will be generated (when hovering the cursor to the empty field, see the hint). Param3 is responsible for the level of tone bursts in dBFS. Param4 and Param5 are responsible for the duration of tone bursts and pauses between them, in milliseconds. Press "OK" after entering the values: adjustment of a rule is finished. Press Apply Changes at the top part of the server control console, to save the settings. Herewith, the configured service ProgramChannel will be reloaded. 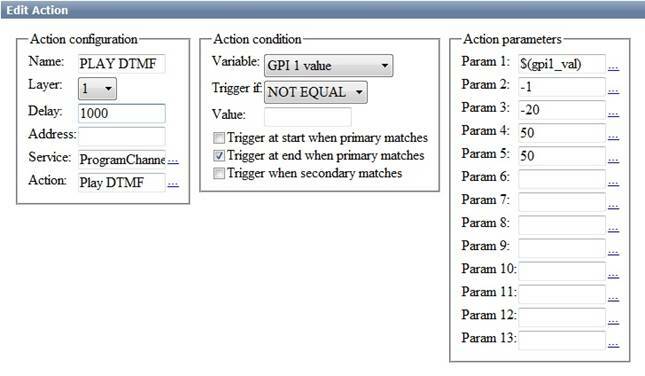 If needed, you may set the transfer of series of tones before the beginning of a block (the so-called "preliminary", "direct" and "immediate" commands), using any fields from the list Action Condition / Vairable, in which you can enter the text: GPI1...8 Value, Keyer1...8 Value, Comment, etc. Columns GPI1...8 Value are more convenient and preferable for using for the next reason: the window Media Browser of the application Air Manager provides fields of meta-descriptions User 1...8 for every clip. If you enter the text into them and put the clip into the playlist line, the clip will be moved to the playlist columns GPI1...8 Value respectively. If you don't want to enter the texts of masks in the playlist columns every time, you may just mark the corresponding clips in the server database. that are signaling about the block end. Besides, the mask itself may pass the information about the number of the block with regional commercials that should be played out, and other service information. The detailed procedure of adjustment of receiving cue-tones is described in here.